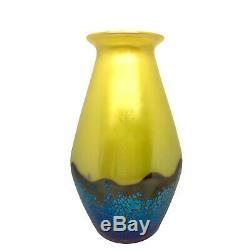 Loetz Iridescent Yellow Blue Glass Vase. 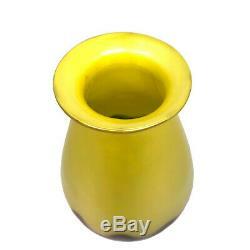 A fine Loetz vase in blue and yellow Ausphrung 226 decor. 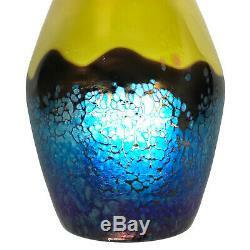 There is a vibrant iridescent finish on lemon yellow and cobalt oil spots pattern. 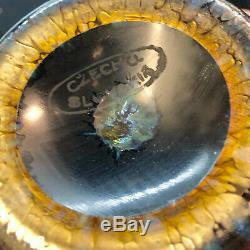 It is signed with an oval Czechoslovakia mark on the base. Referenced in books by Ricke, Neue Gallerie, Passau Museum Catalogue and on Loetz. Dimensions: Height: 7", Width: 4 1/3". We guarantee the items we sell to be as described. The item "Loetz Iridescent Yellow Blue Glass Vase" is in sale since Sunday, February 10, 2019. This item is in the category "Pottery & Glass\Glass\Art Glass\Bohemian/Czech\Loetz". The seller is "acantus" and is located in Charleston, South Carolina. This item can be shipped worldwide. Dimensions: Height 7", Width 4 1/3"